Al Jazeera reports an Egyptian-brokered ceasefire was reached between Hamas and Israel. Israeli source: The report is incorrect. The Al Jazeera network reported on Thursday evening that an Egyptian-brokered ceasefire had been reached between Hamas and Israel and added that it came into effect at 10:45 p.m.
An Israeli source clarified, however, that the report is incorrect. Earlier on Thursday evening, Israeli fighter jets leveled a five-story building in the Rimal neighborhood in northern Gaza. 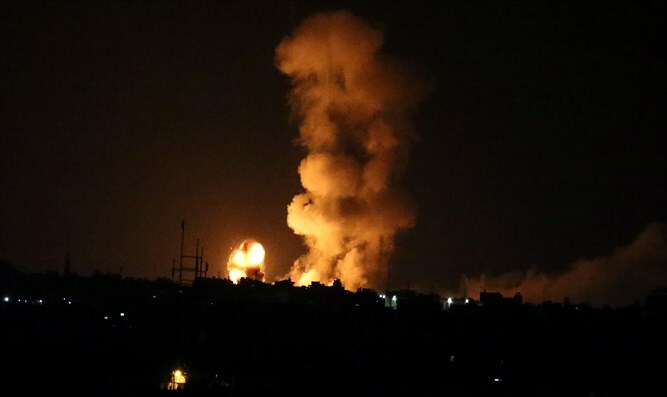 The air strike came hours after a rocket fired from Gaza exploded in Be'er Sheva. No casualties were reported. This is the first time that a rocket struck Be'er Sheva since Operation Protective Edge in 2014. The Iron Dome intercepted more than 30 rockets. Most of the rockets exploded in open areas.